Probiotics are becoming more and more popular these days, as many people are looking for alternative methods of improving their digestion, immune health, and even some digestive ailments that they may suffer from. Probiotics are also popular with those who like to improve their health and absorption of nutrients. So how do probiotics actually work to improve these functions in your body? Probiotics work to increase the amount of "good" bacteria in your digestive tract, to combat the vast amounts of "bad" bacteria that tend to thrive in the digestive tract. When too much of this "bad" bacteria builds up, it can cause a series of uncomfortable digestive issues such as constipation, diarrhea, gas and bloating. When you use a probiotic, you are introducing more "good" bacteria into your digestive system to prevent these negative symptoms from happening and to balance out your digestive tract for improved digestion. It has been proven through multiple scientific studies that probiotics have been able to improve the function of the digestive tract and ease digestive issues. It seems that more and more these general public is suffering from an epidemic of digestive issues. Many of these issues and ailments do not have a cure, either. Most people tend to just cope with these uncomfortable and sometimes embarrassing issues by taking a variety of over-the-counter medications. However, most of these issues only ease the discomfort of your digestive issues for a short period of time. There are a number of digestive issues that are garnering quite a bit of attention in the media and in the medical realm, as they seem to be on the rise. Some of these digestive issues include irritable bowl syndrome, acid reflux, ulcerative colitis, Chron's disease, celiac disease, gluten allergy and intolerance, lactose intolerance and many more uncomfortable digestive issues. Many of these issues are very uncomfortable and difficult to treat, as medication only can ease so many symptoms at a time. Using a probiotic supplement in your diet has shown to improve some of the symptoms and side effects of these digestive diseases and discomforts. It also may improve your overall health by improving how you deal with these digestive issues, increasing absorption of nutrients, improving your immune system and much more. Using a probiotic is easy. There are a number of different ways to introduce probiotics into your daily life. Probiotics are available as a supplement in liquid or tablet form at many local health stores. Also, eating fermented foods such as yogurt is another way to introduce a probiotic into your diet. If you are looking for a probiotic to try, try our probiotic cleanse, the Pro EM-1 daily probiotic cleanse! Our daily probiotic supplement will help you improve your digestive function, maintain a healthy digestive tract, remove toxins from the body, and improve your body's ability to absorb nutrients, as well as helping control the growth of bad bacterias and yeast within the body. Spring has sprung and if you think that you shouldn’t be thinking about your garden until at least mid-spring, think again. These tips can help you improve the quality of your soil and prepping your garden for planting flowers, vegetables and fruits! It has been one long and cold winter and many homeowners believe that they have to put their gardening plans on hold for a little while longer. However, the time to improve the quality of your soil, landscape design and garden management begins now. The following are a few of these procedures that will allow you to begin preparing your garden for the spring. When adding new vegetables, flowers or shrubs to you garden, prepping and improving the quality of the soil will ensure the health of your plants. Healthy soil grows healthy plants. In order for soil to become healthy, they require organic matter. Use soil conditioners, such as EM-1, to get the soil steeped in nutrients now. Organic matter like compost, microbes, and moisture, provides a healthy environment for plants to grow. The result is strong plants, healthier flowers and higher quality fruits and vegetables. Adding a soil conditioner to your garden helps improve moisture retention. This makes water easily accessible for the roots of all of your plants. Coarse soil does not retain water well. The conditioner allows air and water to move through the soil. Since, the organic matter in soil conditioner retains moisture, it is able to absorb and store nutrients more easily. Breathability must be preserved for healthy soil. It is never too early to begin weeding your garden. Digging out the weeds before they are given the opportunity to plant roots in your soil, will save you a lot of time and money in the future. Also, by getting them now before the full on spring season, you will be able to pluck them out before their seeds mature and take root. To guarantee that your weeds will not return, place the pulled weeds deep into your compost pile. The warmth will kill the weed seeds, stopping them from returning to your garden. Lastly, it’s never too early to plan your drainage. A sufficient drainage system will make sure that your plants always have the right amount of water. If your home already has a drainage system, you can begin your spring cleaning by clearing it of leaves, broken branches and all other debris that accumulated over the winter. For an extra benefit, add any organic matter that you can find in your compost. It should give it a dose of carbon in the early spring. If you take the rights steps now, your garden will be ready to take on whatever planting you decide to do this spring. Teraganix can help you build soil quality with EM 1, get a head start on weeds, and prepare your drainage system. For more information on soil conditioners, like EM 1, and their impact on your garden, visit some of our product & information pages on our website. We're proud to provide industry leading solutions for your home and garden! Soil conditioners are full of helpful microbes that are beneficial to plants. In order to grow healthy vegetables and beautiful flowers, it may be necessary to better the garden bed. Soil conditioners are added to the soil to improve physical properties, such as water retention, permeability, water infiltration, drainage, aeration, and aggregation. Soil aggregation is the clumping of soil particles. These particles vary in size and are held together by moist clay or organic compounds. Some particles fit together tightly, while others leave spaces or pores. These spaces are necessary for allowing the soil to store water, air, microbes, nutrients, and organic matter. Properly aggregated soil is more stable, less prone to erosion, and more plant friendly. Good soil is well-drained and aerated, meaning that the air inside the soil is similar to atmospheric air. This is critical for healthy root depth. The ability of water to flow through soil is referred to as the soil's permeability. Compacted and hardened soil resists water, not allowing it reach thirsty roots. Soil conditioners are used to loosen soil and replenish and maintain nutrients. Improving stressed soil and replenishing soil that has been damaged by over fertilization, pesticides or fungicides, will greatly boost plant growth and health. The the addition of a wide variety of organic materials will go a long way in supplementing the soil. The goal is to provide a better environment for roots. Over time, soil can become compacted. This not only makes it difficult for plants for grow, but reduces their ability to draw nutrients and water. The addition of a soil conditioner loosens the soil, supplying loft and texture. For soils heavy in clay, soil conditioners help with aggregation, aeration, drainage, and rooting depth. Porosity and permeability is also increased. For sandy soils, the use of a soil conditioner will improve the water and nutrient holding capacity. Water retention can also be enhanced in very coarse soils. It is also possible to adjust the pH of the soil to answer the needs of specific plants, or to solve the problem of highly acidic or alkaline soil. People have been adding things to poor soil to promote healthy plant growth for centuries. By enriching the soil, plants are able to grow bigger and stronger. When naturally occurring bacteria is added to exhausted or leeched soils, they are extremely helpful in regenerating and rebalancing the soil. Extreme heat, drought, or flooding results in damaged soil. You may have noticed cracks in a dried out garden bed. This is caused by moisture evaporating and leaving behind empty pockets where soil then collapsed. The soil is now tight, compacted and anaerobic (without oxygen). The beneficial microorganisms that once benefited the soil have been replaced by harmful bacteria, making the environment inhospitable to plants. Adding organic matter to the soil promotes natural bacteria, improves oxygen levels, and enhances soil quality and texture. You can generate your own soil conditioner with material from home, to boost plant growth and performance. How much time and hard work have you invested in your garden this spring? As we approach the summer season, don’t let poor soil conditions undo your earlier efforts. Soil health has a direct link to plant health. Plants thrive and fail based on what is available in garden soil. The first step to ensure optimal growing conditions is assessing the makeup of your soil. You can do this with a simple soil test. Nearly every soil test provides Nitrogen, Phosphorous, and Potassium (NPK) levels. NPK elements are essential components to plant growth. If a test reveals an insufficient amount of any of the elements, then it is a warning sign for problematic soil. Plants rely on NPK elements for protein development and photosynthesis. These elements are commonly found in the minerals of the soil, as well as the atmosphere. However, availability of NPK elements in natural sources is limited. A soil test also indicates the soil’s acidity or pH, using a scale from zero to fourteen. Most plants prefer soils with a neutral pH level (a seven), but some plants thrive in soil with more or less acidity. Highly acidic soils can be toxic to plants, limiting the availability of nutrients and destroying root systems. Applying organic compost combined with the EM-1 Microbial Inoculant can significantly improve the overall health of your soil. Of all the remedies for nutrient deficient soil, this is one of the best! EM-1 Microbial Inoculant is a liquid probiotic for soil that supports plant growth and accelerates compost. Applications of EM-1 and compost improve moisture retention in the soil, help plants absorb more nutrients, and restore the natural balance of healthy soil. EM-1 is not a fertilizer, so don't forget to apply fertilizer to your garden for optimum results. It sounds simple: healthy soil will grow healthy plants and vegetables. However, many farmers struggle to get the balance right. Some common issues they run into are compacted soils, clay and contaminated soil. EM1 can improve these issues immensely and allow the health of your soil to progress. To have a healthy soil, it requires a wide variety of microbial activity to break down the organic matter. This will stimulate a healthy environment for vegetables and plants. The outcome is stronger plants, healthier flowers, greater resistance to diseases and pests, and higher quality fruits and vegetable. EM 1 is an organic soil amendment that provides a broad spectrum of beneficial microorganisms, enzymes, vitamins, and various organic acids. It is best used in combination with garden and lawn fertilizers. EM1 is also an accelerator for compost. The organic matter will support the development of other components that are crucial to healthy soil, such as insects and earthworms. In order for your crops to prosper this year, farmers must prepare their soil for planting. Soil needs to be nutrient-rich, to enable your plants to absorb moisture, anchor roots, and grow up strong. Usually you can just start mixing in compost or soil conditioner in to your crop. However, after having conducted a soil test, the soil may need a bit of help first. Finding out your soil type is crucial for creating a regime to improve the health of your soil. A farmer must test the soil to find out the soil type. There are a number of ways to do this. The easiest way is to buy a soil test kit at your local home and garden store. After receiving the results of your soil test and revealing the type of soil you have, there are a number of solutions to get your soil in prime health. If your test reveals that you have clay soil, add coarse sand, EM1, compost, and peat moss. If you have sandy soil, add humus or aged manure, peat moss, EM1, or sawdust. The addition of heavy, clay-rich soil can also be added to improve its health. If your soil test reveals you have silt soil, coarse sand or gravel, EM1 and compost will help the condition. If you can handle the strong smell, well-rotted horse manure and straw will aid in improving your silt soil. Fertilizer is an important step for fruit and vegetable growth. The three fertilizer components that are crucial to your crop growth are nitrogen, phosphorus and potassium. Each of these fertilizers play a different role in creating a flourishing crop this year. Nitrogen is responsible for leaf growth ad makes plants greener. For fruit production and root growth, phosphorus is a common aid. Potassium is useful for fighting off diseases. For more information on soil conditioners, like EM 1, and their impact on your crop, visit Teraganix’s website. Teraganix provides industry leading solutions for your home and garden. They are an exclusive distributor in the US & Canada for Dr. Higas EM-1 Effective Microorganisms, EM Bokashi, Pro EM-1 Probiotics, & EM Ceramics. Are you thinking about composting but are worried about large compost bins in your home? What about having the smell of garbage or compost odors? Don’t worry, switching to a Bokashi bin can resolve your odor and space issues. Bokashi bins are able to recycle your food waste all through the year. 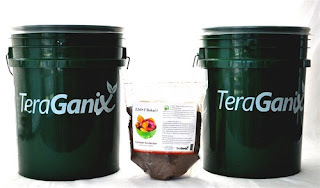 Using an anaerobic fermentation process, the Bokashi bins are able to recycle all of your kitchen waste into valuable and effective soil conditioner for your garden. The Bokashi Bin is an air tight container that composts the waste by using a Bokashi compost starter. EM 1 Rice Bran Bokashi is an example of a Bokashi that can be used in a Bokashi Bin. EM 1 Rice Bran Bokashi is saturated with beneficial microorganisms and is commonly used for food waste recycling, odor control for pet waste, and to accelerate compost and plant residue and mulch decomposition. It can also be used in portable toilets, waterless toilets, and added to potting soil mixes. As mentioned before, your kitchen will not have an odor from your Bokashi bin. That is because the kitchen waste will not decompose or breakdown while inside the bin. It is only when the food waste is placed in the ground with dirt or other carbon materials, that the process is complete and it will begin to breakdown. Keep your Bokashi bin in a dry place and out of direct sunlight. A kitchen cabinet is a good place to store it. First obtain an air tight plastic bin or bucket. Then place your kitchen waste in the bin and sprinkle a small amount of EM 1 Rice Bran Bokashi over your waste. Pack down your waste, using gloves or a plastic bag to do so, and reseal the lid. The microbes found in the Bokashi immediately work to ferment the food scraps, releasing valuable nutrients and enzymes. This fermentation allows these nutrients to come out without the hassle of odors or insects. For every 3 or 4 inches of waste, sprinkle another handful of EM 1 Rice Bran Bokashi. When the bucket is full, place another coat of Bokashi on the top. After the bin is full, let it ferment for 14 days in the air tight container. Then the waste can be taken outside and added to an existing compost pile, placed in your garden or crop or stored in a cooler for future use. After 2 - 4 weeks, the waste will have broken down even further into an organic, rich soil conditioner in which you can spread throughout your garden. However, there are a few foods that may not have broken down completely, such as lemon or orange rinds. They will eventually breakdown in your garden, they just need some more time. For more information on Bokashi, Bokashi containers, waste recycling systems, and their impact on your home, read more on our website. Teraganix provides industry leading solutions for your home and garden.